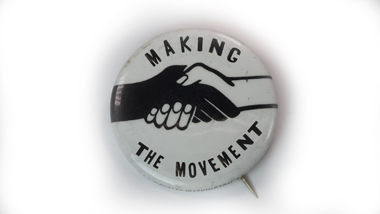 Making the Movement: Objects, Objectives, and Civil Rights currently offers for sale a pinback with our logo, which resembles the design of those used during the Civil Rights Movement.The proceeds from merchandise sales help the project expand the collection and further additional research. The pinbacks are made in the United States from 100% recycled materials. Pinbacks are $6 with free shipping.